This weekend Jeanine Pirro of Fox News invited the in-house Fox “terrorism expert” Steven Emerson to explain the impending apocalypse that is looming over the planet due to radical Islamic terrorism spreading to every nook and cranny of the globe. Emerson warned that the crisis is so severe that murderous Muslims have already taken over some Western cities. Emerson: In Britain, it’s not just no-go zones, there are actual cities like Birmingham that are totally Muslim where non-Muslims just simply don’t go in. It didn’t take long for that morsel of fear mongering to be shot down as utterly false. Later in the day Emerson himself apologized profusely for his “terrible error,” however, neither Pirro nor Fox News has issued a retraction. 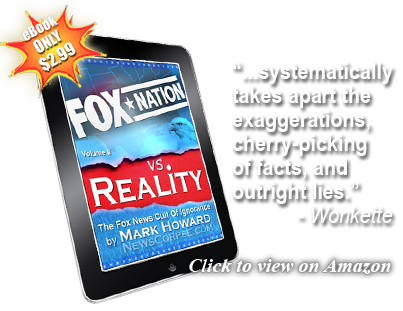 Consequently, Fox News viewers will remain profoundly misinformed, as usual. The Internet, though, has a certain self-healing capability that tends to just this sort of dishonesty. Before long the hashtag “#FoxNewsFacts” was trending on Twitter with a barrage of both serious and satirical posts asserting a sort of cyber karma. 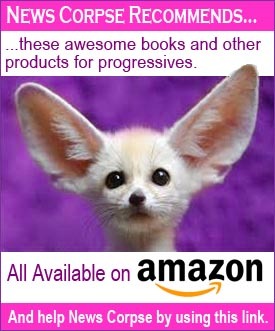 The book contains more than 50 examples of deliberate falsehoods and blatant propaganda. It’s available now on Amazon and every purchase helps to support the work we do at News Corpse. 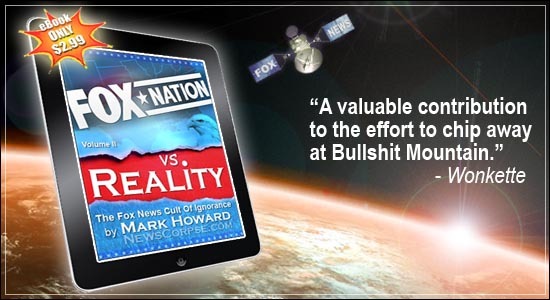 The pathological liars at Fox have been particularly busy disseminating disinformation in this aborning new year. In addition to providing a platform for bona fide Islamophobes like Emerson, they have launched an assault on President Obama for not jetting off to Paris to march in a photo op with some other world leaders who Fox usually hate. 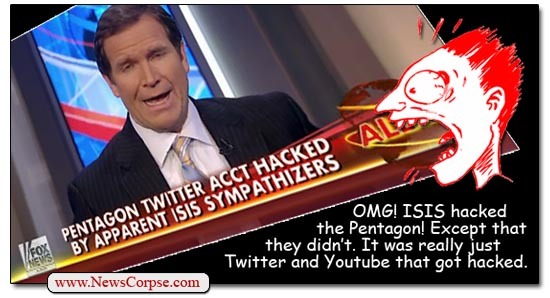 And today they waxed panicky about what they called a hack into Pentagon computers that was really just a hack into Twitter and YouTube. No government network was accessed, but Fox spent most of the day ruminating on it. It’s what they do. Fox News is an oxymoron. Their so-called announcers are merely carnival barkers and Fox is just a circus in town. Can you imagine a Walter Cronkite having anything to do with clowns like these people? I would love to see a compilation of all the racist and disrespectful things fox and its clowns and guests say about the president dating back to 2008. I remember on several occasions Bill O’reily refered to the president’s dead mother as a hippy and his father a cad; Hannity, Bill Oreily, and Dennis Miller regularly call the president Barack. Julie Banderas refered to the president as an alligator during his 2008 campaign and that clown Jenine Piro regularly hurls insults at the president. The fox clowns are a disgrace to the nation. They praise the tyrant Putin over their own president, that’s how demented they are.